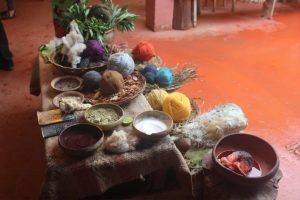 How I learned the ancient alpaca weaving techniques of my Peruvian ancestors with the Women Weavers of Chinchero. 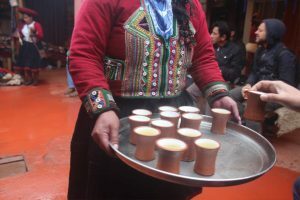 Our welcome into the weavers’ collective included a smile and a mug of coca-leaf tea. I can’t think of a friendlier gesture at these soaring altitudes! (Coca eases its affects.) Chinchero, a rural Quechua weaving town not far from Cusco, sits comfortably (but nauseatingly) at over 3,700 metres above sea level. That’s high, and nausea can be an effect of altitude. A very friendly and local welcome, coca tea to fight altitude sickness. The altitude is no problem for the locals, who have adapted to life in these oxygen-depleted mountain conditions. 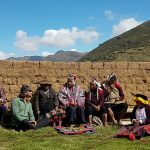 The descendants of the Incas in this region still carry out many of their ancient practices, including farming and weaving. 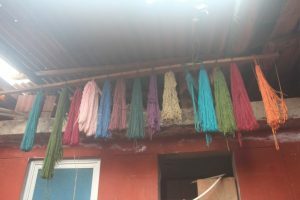 Female weavers, in particular, have worked traditionally in the area for centuries, with techniques passed down from generation to generation. To encourage female financial independence and cultural conservation, the practice has seen a rise in recent years. The teaching aspect helps in preservation and weavers start young; workshops are held for village girls after school and on weekends. 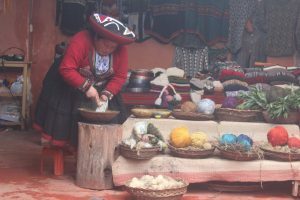 And although the weaving in these regions is associated with women, elsewhere in the country (Lake Titicaca, for example), it’s normal to find communities of male weavers. Before the demonstration, we all stared intently at the various items on display. “Does anyone know what this is?” Fiorella, our weaver-slash-guide, dressed head-to-toe in the region’s traditional clothes, asks us, breaking the ice by grabbing what appeared to be a bone. “No, it’s not a bone of a tourist who didn’t buy any alpaca goods to take home,” she says with a hearty laugh from the crowd of a dozen or so good-humoured tourists and potential shoppers. Grating the root to produce all-natural non-grocery-store detergent. The “walk-and-spin,” a completely normal form of multitasking in Chinchero. The deep red produced by squishing a cochineal bug. 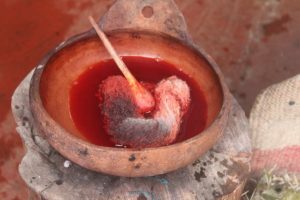 When mixed with water, the insect produces a deep red pigment that dyes the wool when it is dipped into the bowl. Interestingly, Fiorella shows us that adding salt or lemon alters the pigments, resulting in various shades. Once you have the desired colour, you dip the yarn into the mixture, keeping in mind that soaking time affects the intensity of the colour. Collpa, a mineral found in the jungle, is used to hold the colour. The yarn is then hung to dry, until it’s spun a final time. 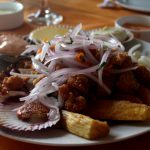 For adventure options in PERU click here! The table in front of us is fully displayed with leaves, bark, moss, flowers, roots and vegetables, all of which can result in dyes in pretty much every colour of the rainbow. All the colours of the rainbow, all made with natural ingredients! 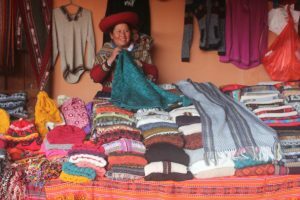 Once the brightly-coloured yarns are created, the women weave them into intricate textiles, and we learn that different villages and regions in Peru have their own iconography and patterns which have been passed down through the centuries. Bones and sticks are used to create a back-strap loom. Weaving on a back-strap loom. The process can take two months! Fiorella also tells us there’s an international airport coming near Chinchero for better access to Cusco. But the weavers with us today share their concerns at having such steady traffic in the area that could impact their cultural traditions. Handspun wool ready to be intricately woven. And then Fiorella leaves us with a final tip. 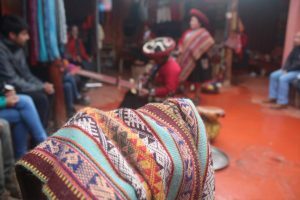 In Peru, no tourist can leave without some kind of alpaca souvenir, whether it’s a sweater, scarf, beanie or gloves found at markets all over the country. And it’s possible, she says, to tell the various types of alpaca wool used just by the feel of it. If the price is too good to be true, you might just have your answer! 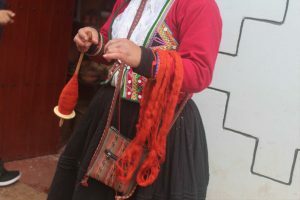 The wool used in most clothing or textiles you’ll find as you search for souvenirs ranges from mixes of alpaca with synthetic materials (usually heavy on the synthetic) to pure alpaca wool, and the finest, least-itchy but most-expensive, baby alpaca. It’s the first and therefore softest wool that can be sheared from an alpaca, normally within the first two years of life. This textile is made from pure alpaca wool, it feels cooler and heavier to the touch. Alpaca wool feels cooler and is heavier than acrylic and mixed wool. When buying, check the inside of a garment – acrylic often gets brushed on the outside to appear softer, but the inside is rougher. You can also tell the wool’s purity by its colour, as alpaca wool dyed by natural processes has more muted colours than its synthetic counterparts. A wide assortment of alpaca goodies – can you pass the test? “So what do you think this is?” Fiorella asks, as one final test, as she passes around a wool sweater that feels a little light and coarse, indicating it contains synthetics. “Baby alpaca? More like maybe alpaca,” she quips to another round of laughter. 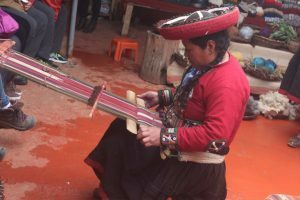 After a round of shopping, we leave with a newfound appreciation for the art of weaving, but also with the survival skills to make it out there in the markets of Peru. Carla Bragagnini is associate editor of infromtheoutpost.com PERU. All photos by her.